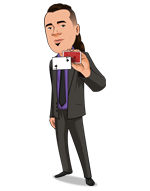 Today, when you order "Peanut Butter and Jelly PRO presented by Dan Harlan", you'll instantly be emailed a Penguin Magic gift certificate. You can spend it on anything you like at Penguin, just like cash. Just complete your order as normal, and within seconds you'll get an email with your gift certificate. Peanut Butter and Jelly PRO presented by Dan Harlan (Download + Gimmicks) ALL NEW PRO PRESENTATION. The family-show trick pros swear by. HILARIOUS, visual & easy-to-do. BONUS (July 16): Dan Harlan has taken PB&J to a new level with his reputation-making presentation. Order today and get his all-new instructional video including pro tips, timing, scripting, and more. 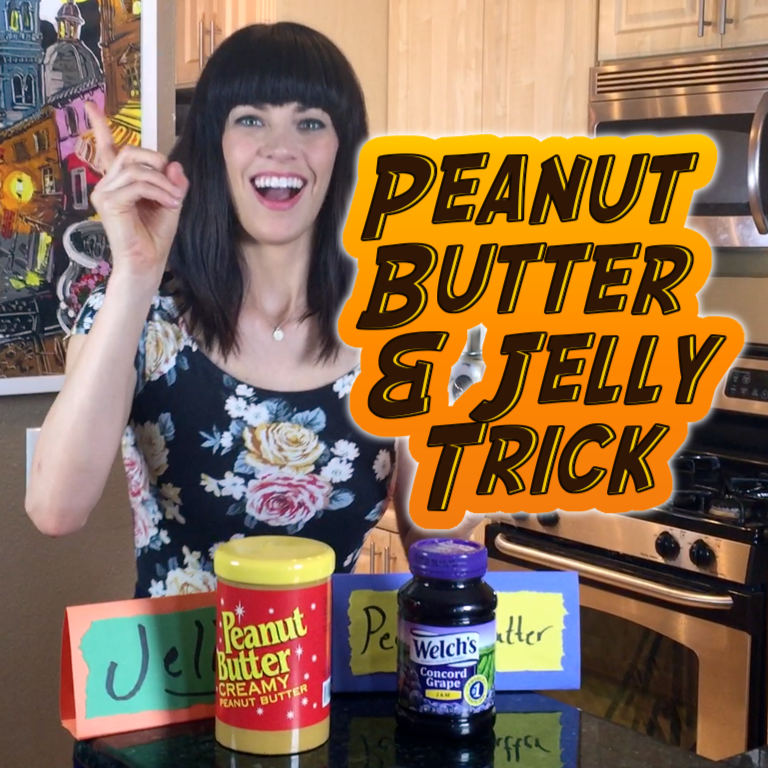 You display a large jar of peanut butter on one side of the stage and place a jar of jelly on the other side. You place a black cover over each jar. 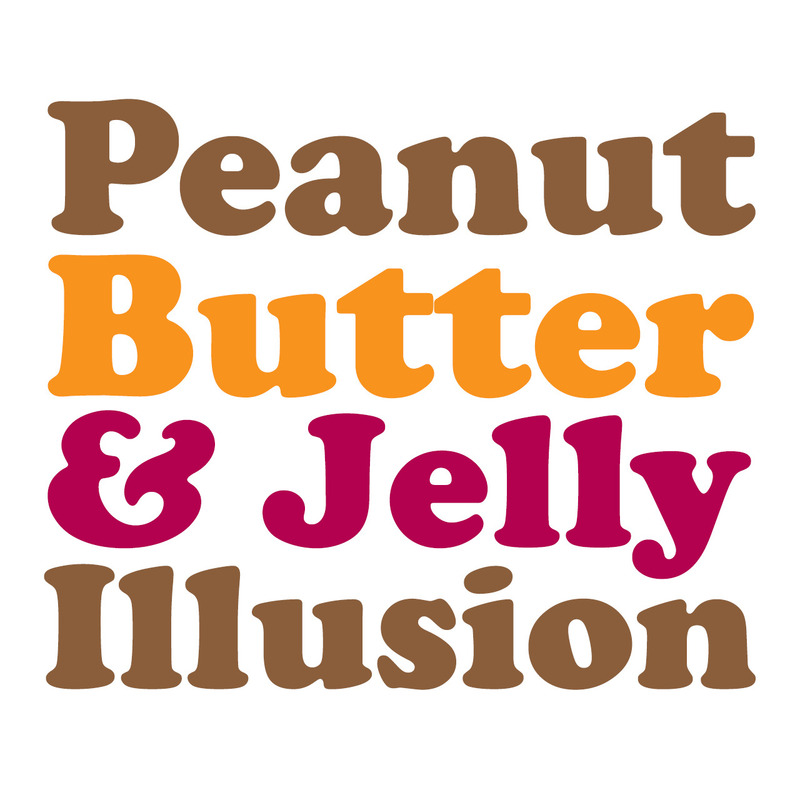 After a few magic words you tell your spectators that the peanut butter and jelly have changed places. The kids are naturally a bit skeptical... You really get them going by offering to repeat the miracle and return the jars to their original locations before you lift the covers! The kids are ready to start a riot! They're unconvinced to say the least. Until you lift off the covers and show that the change really did happen! Great for kid's parties and lots of fun with adults. This effect comes with illustrated step-by-step instructions. This product is compatible with most popular jelly brands off the shelf. BYOJ= "Bring Your Own Jelly..."
Ok so any kid's entertainer knows that this is a great trick. Something about it floors kids, I did it the standard routine for 30 8 year old kids today and was told I was awesome by a large proportion. What did bug me though was the routine that accompanied it, it just didn't work the way it was described. So I contacted the very lovely Mert at Customer Service and within a week Penguin posted the new Dan Harlan video, which is simply BRILLIANT. I mean seriously this is BRILLIANT. He takes this whole trick to an entirely new level, and explains it extremely well. As yet I haven't tried the new routine (it requires a bit of additional setup), but I knew when I saw the video that this goes beyond what I ever expected. $80? With the new routine it is worth far more. A surprise win after a shaky start! Congrats Penguin, Mert and Dan Harlan! I just did the trick at a show with a few tips from the discussion here at Penguin. Plus I used the peanut butter and jelly song to get the whole crowd up and standing and singing. It was clearly the best trick of the show. This is one of those must kids show tricks. I must have it in my show...Always! 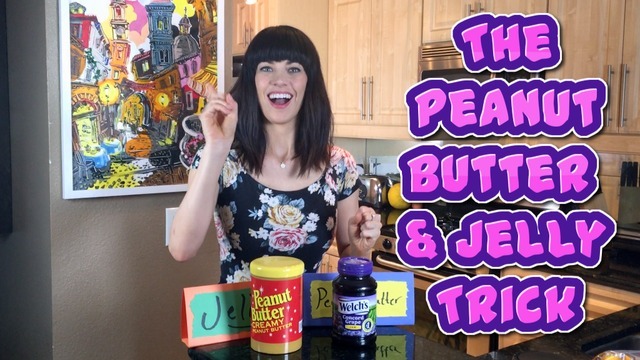 The patter is very flexiable, sometimes i say "its a trick i can teach you how to do, telling them they need a jar of jelly/peanut butter and 2 covers..then they magiclly switch sides" - Sometimes I have a contest: "Who thinks the peanut butter is over here? and how many think its over here...are you sure?" - you get the point. Its fablous...! This trick is great thing to include in your kids show. Adults will probably figure it out and it's not really that impressive to them either but kids will love it. There is so much kids stuff out there and this one is really underrated. The downside is that nothing is examinable but if you are doing magic for kids, they probably won't even ask you anyways. The kids love it. 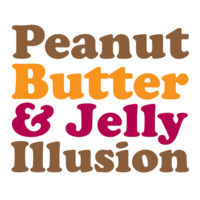 They never complain about the the black covers, (the fact that they are flexible makes the trick easier to do) and they never think about it not being real peanut butter. After all, it says "Peanut Butter". You do have to buy two jars of jelly, but only once. Don't open them and they last forever. And, put a bag in a kids hand with two pieces of bread in it. After the switch, show the bread with peanut and jelly on it. They'll go wild. Really fun trick. 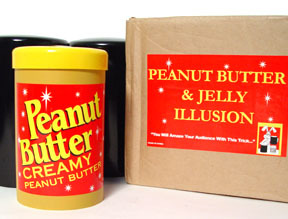 Just be careful, if you have small hands it might be a little tricky, and the peanut butter jars look fake, but other than that. awesome. It does exactly as it says, it is exellent quality. You have to buy your own jelly though.